More than 35 million people die of chronic disease annually & 60% can be prevented with the right knowledge. Healthysparx provides a platform for people to access and share this knowledge in a way that’s meaningful to them. 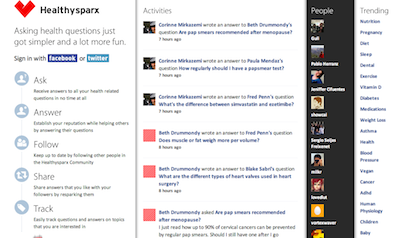 One can think of Healthysparx.com as that place where everyday health questions are answered. Healthysparx is the first social Q&A platform dedicated to empowering people to take ownership of their health in a fun and simple way.